Shortly after moving to LA in winter of 2014, I joined the Riverside Astronomical Society so that I could take advantage of their dark sky observing site out in the Mojave Desert. At that point my astrophotography pursuits were entirely mobile and I was lugging my gear around and setting up/breaking down everything for each trip. As luck would have it, shortly before I joined the club they had acquired an additional five acre property next to the existing site which would allow additional observatories to be built at the site. I quickly placed my name on the wait list and less than a month later I was given the green light to proceed with building my own observatory. The site is known as the Goat Mountain Astronomical Research Station or GMARS for short. A ~3 hour drive from Los Angeles, this site is in the California high desert north of Palm Springs. While this is by no means a perfect location for astrophotography, it's probably the best I'm going to get within a reasonable drive of my home in Redondo Beach and within my price range. From this site, sky glow is still very evident to the southwest (from the LA basin) and to the south/southeast (from nearby Yucca Valley and Joshua Tree). Sky glow from Twentynine Palms and Las Vegas are also evident to the northeast, although to a much lesser extent than the others. I started building the observatory in May 2015 and completed it in July 2015. Originally I planned to build from plans I purchased from SkyShed; however, after receiving the plans and reading through them thoroughly, I was pretty disappointed in their design. I felt the wall sections were weak (T1-11 siding over studs, no insulation or interior sheathing) and the rolling mechanism was very poor (garage door track and rollers). So, I just started building and tweaked things to my liking as I went along. I will try to explain my thought process and reasoning as we go through the photos. Since I have construction experience I elected to build the observatory myself, with exception of pouring/finishing the concrete foundations. I dug and formed the foundations myself and hired a two-man concrete crew to place/finish the concrete. The amount of concrete required (about 5.5 yards) is simply too much for one person alone to pour and finish before the concrete starts to set up. Construction began with digging out for the foundations and telescope pier. The perimeter wall footing forms are 2'-6" tall by 12" wide, with 2-#4 reinforcing bars top & bottom. Others at GMARS had experienced wind eroding the sand out from underneath their observatory foundations (it can get very windy out here in the mid-afternoons) so I elected to run my foundations deep to hopefully eliminate this concern. The pier footing is 40" x 40" x 12" with 3-#4 bottom bars each way. From there, 6-#4 hook bars extend up into the pier, which is 24" diameter and formed with sonotube. A 2-1/2" conduit provides data to the center of the pier, along with a separate 3/4" conduit for power and grounding. The bottom of the pier footing is 40" below grade. The footing and pier were poured at once; however the footing was allowed to set up for about a half hour before the pier concrete was poured on top of it. Otherwise the hydraulic pressure would have caused the pier footing to rise up as the pier was poured. I have a Le Sueur pier, so the bolt template was made to fit. The J-bolts are 3/4" stainless steel. After the foundation concrete was poured, I went home for a couple days to let the concrete set up. Upon returning I removed the formwork and framed out the subfloor with 2x6's and 3/4" plywod. The floor framing was attached to the concrete foundations with heavy guage steel angle brackets, concrete anchors and bolts. The plywood subflooring was glued and screwed down. Wall framing started the week after the foundations were poured, and went very fast. The north wall was framed to accept a 6,000btu window air conditioning unit and the east wall was framed to accept a 36"x80" steel prehung door. The outrigger beams were built as shown in the SkyShed plans, using 2x4s glued and bolted together. While this may work just fine on paper, in reality this is a terrible design. The beams could not be made straight, not to mention they looked hideous. Also, the post anchor called for in the plans to secure the 4x4 posts to the concrete outrigger pedestals is also a terrible design as they do not provide any side-to-side reinforcement for the posts. Therefore there is nothing to prevent the entire outrigger beam assembly from wobbling when you push on the posts and/or when the wind blows. In later photos I will share how I solved both of these problems. The SkyShed plans called for T1-11 siding directly over the studs, but this does not make for a very sturdy wall section in a windy desert. So, I elected to sheathe the walls with 5/8" radiant barrier plywood. The sheathed walls were wrapped with roofing paper for a moisture barrier. For siding, I went with James Hardie "HardiPanel" from Home Depot which has a 30-year warranty. Painted T1-11 siding (called for in the SkyShed plans) does not fare well in a desert environment and would require a fresh coat of paint at least once a year. The HardiPanel should hold paint much better. installed in their place. The gluelam beames look and function SO MUCH BETTER! To reinforce the wobbly vertical posts, I used some scrap 24" sonotube and poured additional concrete up and over the post anchors so that they could no longer wobble. The new concrete was doweled into the old concrete for support. The roof base frame also utilizes the 4"x8" gluelam beams on the east/west sides, with a 2x10 ripped to width along the north/south sides. The roof rolls on V-groove wheels mortised into the beams, on steel angle iron that runs along the beams. The angles w/ bolt tabs were fabricated at a local welding shop. Notice the additional angle on the inside top of the walls -- these are for uplift brackets that will be installed later, to prevent the roof from lifting up under heavy winds. Galvanized drip edge flashing was installed around the perimeter of the roof. I realize it's best to have this underneath the roofing paper rather than on top of it, but it's very windy at this site and so I felt better putting the drip edge on top of the paper to secure it down. And lastly the metal roof panels & ridge cap were installed. The exterior lumber was treated with exterior deck stain to protect it from the elements, and primer was rolled on the siding. I was then able to focus my attention on the inside of the observatory. I started by roughing in all of the electrical, which consisted of three red LED lights on a dimmer switch, three white LED lights on another switch, an exterior red LED light on another switch, several wall outlets, an exterior GFCI outlet and a grounding rod w/ ground wire to the pier. Meanwhile a large wildfire (known as Lake Fire) was burning freely at nearby Big Bear Lake. The photos below show the impact of all the smoke on the surrounding environment. It was pretty insane to see it burning live. After the electrical rough-in inspection passed, the interior walls, gable ends and roof received batt insulation and were covered with 1/2" sanded plywood. A window air conditioning unit was installed and powered up to begin conditioning the interior space ahead of primer/paint. After a few hours of cool-down, the painting began. I went with a dark blue color for both the walls and roof. The pier concrete was sanded and painted gloss white. After the walls were painted and dry, I wired up all the outlets, switches and light fixtures. The lighting consists of three white LED fixtures on one switch, three red LED fixtures on a second switch w/ dimmer, and a red LED exterior light fixture on a third switch. A concrete stair was formed and poured at the door - no more climbing cinder blocks to get inside! For the interior flooring I went with click-lock engineered hardwood flooring. It was inexpensive, went down very quickly and should last the life of the observatory. I originally planned to buy a computer desk for the observatory, but had the idea of installing base cabinets with a countertop for more space to work on. I'm glad I went this direction as I think it works better and I like the built-in look. The base cabinets are standard 34" high cabinets from Home Depot, but I cut off the bottom 4" of each cabinet (where the toe kick was) to lower them down to desk height (30"). The countertop also came from Home Depot. Next up I pulled power, grounding and data to the pier. Then I was finally able to install the pier, mount and scope. I considered installing a murphy bed on the south wall, but was concerned it would look terrible. I wanted a "real" bed (box spring, nice mattress, pillows and all). Ultimately I went with a standard twin bed which still allows plenty of room for fiddling around with the south side of the scope. That being said, I really only played on that side when I was doing polar alignment. Once that was done, there has really been no reason to be on that side unless I'm sleeping. After the bed was in place, I then spent a solid day getting all the scope equipment set up, software installed, cables neatly routed and that sort of stuff. 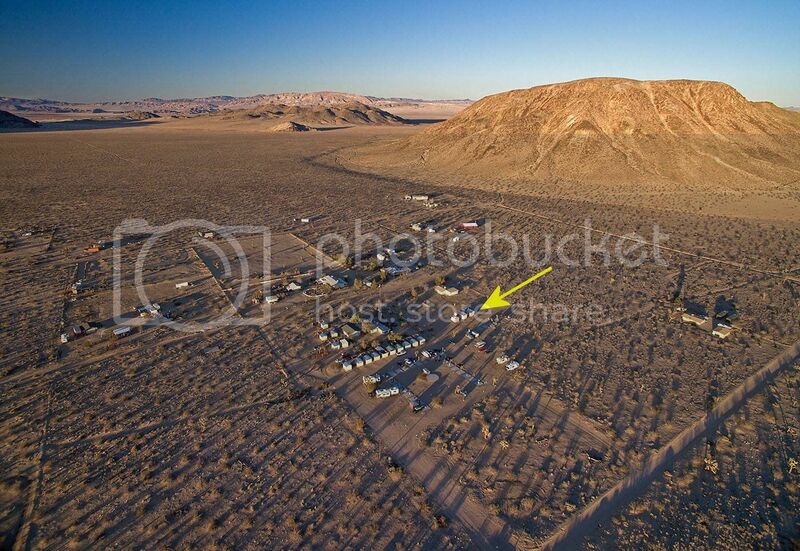 Lastly, MojaveWiFi came out and installed broadband internet service to the observatory. I went with their unlimited data plan at 2.5mbps. That can't begin to compare to my cable internet speed at home, but it's pretty good for the location and price. To motorize the roof I installed an Aleko AR1450 gate opener, and to allow remote operation I connected it to a Gogogate2 internet controller. This setup will allow me to open the roof and image with the telescope from anywhere via the internet. I installed Hikvision DS-2CD2532F-IS/2.8mm camera to monitor the scope and roof positions. After about 4 hours of troubleshooting, I can say that the Hikvision camera is NOT an easy camera to setup! It requires knowledge of various computer networking jibber-jabber and is not a plug'n'play type camera. But, the image quality and vast features of a camera like this made the setup troubles all worth it. I also installed a Belkin WeMo switch which will allow me to turn on the scope, cameras, mount, etc. remotely. That little device, on the other hand, was plug'n'play and I had it up & running in about 3 minutes after opening the box. Lastly, I installed a PC in the observatory. Before now, I was taking my laptop back & forth and using that to control the scope. But, with remote imaging I will need a computer in the observatory full time, so I went with a Lenovo K450E tower and dual Samsung 27" LED monitors (for when I do happen to be at the observatory). For remote control I am using LogMeIn. I replaced the Belkin WeMo switch with a DLI Web Power Switch 7, which has eight IP-controllable outlets and an auto-ping feature that automatically reboots my internet router if it loses internet connection. With the old WeMo switch, if the internet went down and the router needed to be rebooted, there was no way to do that without physically being at the observatory. This nifty gadget solved that problem and was only $100 on eBay. I also installed a weather station for remote monitoring of weather conditions. I went with the Ambient Weather 1400-IP which I picked up on Amazon for $159. This model is wireless, so I was able to mount it to the north peak of the roof. I mounted it with 1" EMT conduit, which was a perfect fit (honestly it couldn't fit any better than it does) for the mounting post that comes with the unit. I also installed a key code deadbolt, so that other club members can get inside my observatory should the need ever arise, such as the time I needed to unplug my guider camera and plug it back in, but I was 3hrs away at home.